Thank you so much for attending my recent talk and I hope you got things out of the session that you’ve felt able to implement in your day to day from today! Remember never to feel guilty if this was day 1 of your curiosity towards what’s in our food, or if you’re just sometimes to get it ‘perfect’ – whatever perfect means. Stay positive and enjoy finding great options and new ways – and eat the cake at the birthday party and enjoy every bite! My instagram @LowToxLife and website www.lowtoxlife.com – which you’re on right now! Interested in health topics and podcasts? My podcast “Low Tox Life” is available on ITunes for Apple and Stitcher for android. All details and episode previews in that link. Interested in children’s appreciation of whole, real foods and maximising their health and vitality? Sign up for the next round of THRIVE where we cover everything from nutrients required to fussy eating to psychology of food and more with live coaching in a private facebook group. THRIVE COURSE. Fancy stocking up on well priced organic pantry staples for delivery to your door to avoid having to go to supermarkets? Organics on a budget is great. I also order a fruit and veg box a week and get my meats delivered by the butcher, to minimise shopping time and get more quality time with the little man / relax time for me. Then it’s a matter of picking up the odd item in between and visiting a nice market for a wonderful food buying experience. Less brightly lit shopping aisles packed with loud marketing messages – both for big and small people! That APP to help your ordering for the centre be safe and low-to-know additives. Lunchbox tips?http://www.lowtoxlife.com/the-inaugural-lunch-box-and-lunch-box-tips – Remember for lunch boxes variety is key. Small quantities of varied things rather than ‘big commitments’ to 2 things. I like to say “something raw, something crunchy, something cooked, something leftover, something proteiny, something with healthy fats, and from there, work through what I’ve got in fridge and pantry to create a varied lunch box. Being well stocked is key. Kitchen tips to minimise the time you’re cooking but maximise the output of what you can achieve? EFFICIENCY TIPS. Remember: Variety, variety, variety. That’s the key! Dried Fruit – Watch for 200, 202, 220, 223 – Sulphites. Much research on its respiratory effects on children especially. Asthma, headaches, eczema, hives, dermatitis. Desiccated / shredded coconut brand without 220 in supermarket? Woolworths MACRO, otherwise buy from a bulk bin store or organic from health shop. Many “glutamate” guises: 621, 624, 627, 631, natural flavour (not always but sometimes it hides there) yeast extract, hydrolised wheat or vegetable proteins. Negative effects on Brain. Switch from ‘flavoured’ snacks (think ‘cheese flavoured, chicken, sour cream and chives, BBQ etc) and buy PLAIN. The crunch and saltiness is the appeal, and we don’t need the glutamates to be messing with their or your brains. SAKATA plain rice crackers are a great supermarket option (unfortunately pekish and fantastic even the plain variety still has MSG). Health shops have many other options. Make vegemite a sometimes food not a daily sandwich and snack go to (alternate with squshed avocado, nut butters, humus, other dip-like spreads. Try cutting 1/3 – 1/2 cup sugar from recipes – it will usually go unnoticed. Add a little honey to plain yoghurt vs added sugar hiding in fruit and vanilla ‘flavoured’ yoghurts. Stop buying flavoured yoghurts, flavoured milks, fruit and honey type pre packed porridges, cereals and pre mixed marinades and sauces. There is a lot of sugar and stabiliser filler in these sorts of foods. Be in control of the sweetness you add at home. Nothing wrong with a little sugar here and there, even every day the W.H.O says 4-6 teaspoons a day, but this can be blown by 9am very easily if we’re buying packaged products that contain hidden sugars. One of the greatest enemies of fostering a love of real food. We lose the opportunity to teach and for them to learn about texture, look, feel, taste of real food as well the absence of much of the nutrient value in the fresh food, depleted in the pasteurisation and long life storage format. Children also don’t develop the strength of their teeth and jaws with prolonged and over use of liquid foods. Great for emergencies and long days out where you won’t be able to prepare food – perfect for those occasions in fact – but that’s about it. Keep for a back up plan rather than a ‘go to’. Never cook one meal only enough for one sitting. Can you put on: An extra tray of roasting veggies, double the sausages so you can cut them sliced for lunches to go with veggie sticks? Double the casserole or stew to freeze for a crazy day where there’s no time to cook? A whole extra meal if there are over lapping ingredients? Ie, get two big saucepans or crock pots on the stove and do 2 x onions, 2 x carrot celery, and then 2 different meats, spices etc and have them cooking side by side – One for today, one for a crazy day? Always aim for leftovers for healthy work and school lunches and less reliance on sandwiches – they’re fine with a good quality bread, but they’re not sustaining you until dinner or even mid afternoon, given it’s high carb and low protein / fats / phytonutrients. Variety is key so the sandwich becomes part of the rotation rather than the whole focus. Invest in a slow cooker. I recommend the Cuisinart ceramic one (you want to stay away from PTFE / PFOA “teflon” type non stick surfaces. Read HERE for why). Once you have a Slow Cooker, you can simply throw in a whole bunch of things in the morning, set it and forget it and walk in the door to a wonderful meal that you can have with a mixed leaf salad, or some quickly steamed veg, or roasted veg while you do the bath / shower / unwind time. Slow Cooking is the way forward and it’s worth investing in a couple of books for ideas. 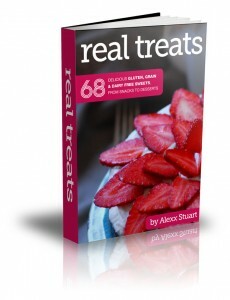 Recipes that have gluten / dairy / egg free aspects, whole food ingredients and simple instructions. Master a couple of them and feel adept, rather than always trying to make something you’ve never made before. SIMPLE FAMILY MEALS can be found in the RECIPE tab on the HOME PAGE. – soups, meats and veggies are there with loads of ideas. And voila. I trust this gives you plenty to get along with and discover and I hope it inspires a shift more towards produce and less focused on product. At the end of the day if we focus on PRODUCE and variety, we set ourselves best up to thrive – both big and little people alike!